Garry Holloway left a career in geology and in 1976 established Melbourne diamond design award winning jeweller, Precious Metals. In 1984 he studied the Fire Scope™ while undertaking the Gemological Association of Australia’s Diamond Diploma. This led to a long and passionate interest in the cut of diamonds. After the publication of the GIA’s ‘brilliance’ report in 1998 this passion became a crusade to improve the cut quality of all diamonds. 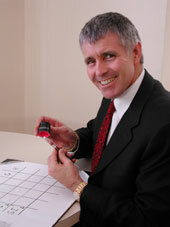 Garry developed the patent pending HCA system in 2000, and released a portable Ideal-Scope in 2001. HCA has been used to grade the cut quality of more than a billion dollars of diamonds in its first year alone. Garry’s Diamond-Cut consultancy has strong alliances with leading international diamond researchers and websites.